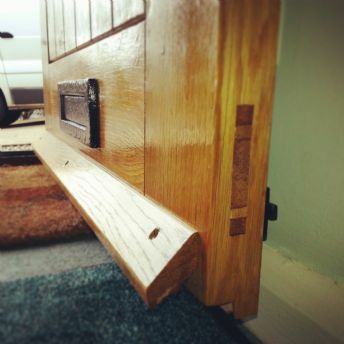 Our installation team fitted this solid oak cottage door on Knights Close, West Bridgford Nottingham. This customer also had a new bespoke composite door installed on the back of the same property on Knights Close, West Bridgford. If you require a new front or back door in west bridgford or surrounding area, email us at info@davesdoors.co.uk. This customer on Knights Close (just off Walcote Drive) in West Bridgford chose to have a timber door installed as their new front door. They chose the engineered mexicana geneva oak external door with through mortice and tenon construction as you can see in the image. They chose antiqued black hardware and door furniture which gave this door a more traditional look but is also in keeping with the property and the style of the houses in the surrounding area. This door was finished with a high gloss varnish to finish off the over all look. In contrast to this Oak front door the customer chose a GRP composite back door. They wanted a composite for their back door for the added security and the thermal efficiency as the kitchen out into the gerden was quite a cold room. After designing a 2 panel 1 square door in a dark green finish, they decided to go with frosted satin glass as the light was need because the close proximity of the next door neighbours property. The satin glass adds to the privacy while still letting the day light flood in. West Bridgford is in the Rushcliffe borough of Nottinghamshire in the East Midlands and comes under the NG2 postcode. We carry out a lot of installations and door fitting in this area.